William Scott was born in Greenock, Scotland, of Irish and Scottish parents and was brought up in Ulster. He studied at the Belfast College of Art between 1928 and 1931 and at the Royal Academy in 1931-1935. Between 1937 and 1939 he lived in France, mainly Pont-Aven and St-Tropez. Scott said that he picked up from the tradition of painting that he felt most kinship with – the still-life tradition of Chardin and Braque, leading to a certain kind of abstraction, which comes directly from that tradition. His work continued to be based on still-lives, although from the 1950’s he began painting pure abstracts. They featured forms such as squares and circles, but were not geometrically exact and were bounded by sensitive painterly lines. In the late 1960’s and 70’s his style became more austere. Scott is regarded as one of the leading British artists of his generation. He won several awards including first prize at the John Moore’s Liverpool Exhibition. 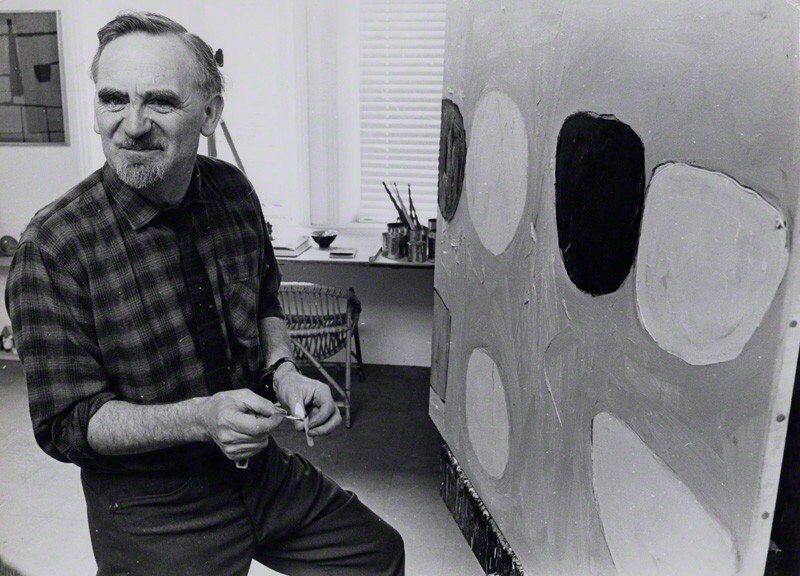 His work is represented in the Tate Gallery, London, and many other collections in Britain and elsewhere. He lived mainly in London and Somerset.